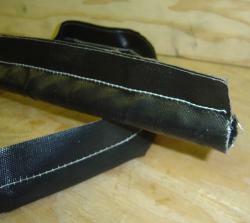 The fabric covered wire core gaskets will provide an air tight seal on uneven surfaces, not possible with metal seals. 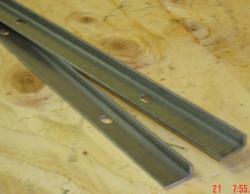 These door seals are used extensively on all types of board dryers. Tough Teflon coated fiberglass cloth wrapped around a Stainless Steel Wire core with 3/4" bulb x 3/4" tail . Other sizes are available- Call for details. An extruded Hi-Temp Silicone in a tadpole shape with a 3" tail- we sew a strip of our Black Max fiberglass cloth on the tail to rub against the end rolls to form a barrier to minimize heat loss. Hold down angle 14 Ga. 3/8" x 3/4" - pre-punched holes- comes in 5FT. lengths. Used in conjunction with our Black Max tadpole seal. Stainless steel door seals feature ease of installation and low cost! 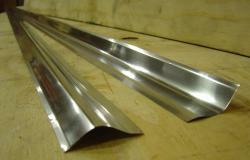 Stainless Steel formed to provide an economical seal. Specially formed Stainless Steel to provide an economical replacement for OEM product.